Dirty Bertie is a boy with lots of disgusting habits, madcap plans and crazy ideas. This is just the sort of book Luke loves and I could hear him giggling and laughing as he read this book. There are 3 stories in the book with each split into 4 chapters which make it easy to pick up and put down for younger readers. The writing is very clear and the illustrations are excellent. Luke's favourite story of the three was Toothy because he said it was the funniest and he could relate to it as he hates the dentist too! 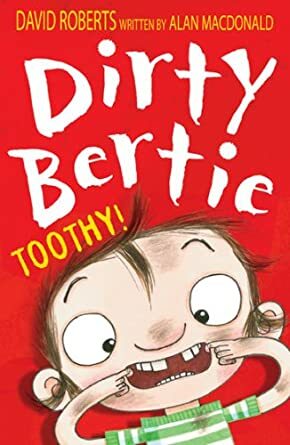 He has already said he wants to read more Dirty Bertie books and fortunately as this is the 19th Dirty Bertie book we have plenty more to collect.